Just a short Brandon Lee biography. I will be adding a lot more to this page as I find more information about his life. I would like to add a lot of information I know fans like myself would appreciate. 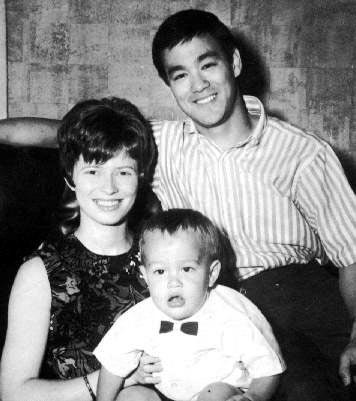 Born in Oakland, California on February 1, 1965 to legendary film and martial arts icon Bruce Lee and wife Linda Lee Cadwell. As soon as he learned how to walk, Bruce started training him in the martial arts, mainly Jeet Kune Do, a style that Bruce had invented. At 6 six years old Brandon could break boards. His father took him to many martial arts events and seminars, several which were televised. Brandon was very close to his father. They did everything together, playing, going places, you name it. It was very hard for Brandon to have friends when he was younger because all the kids were scared of his house. Because they always heard the yells and noises coming from the Lee's home. Which was Bruce and his students and friends practicing. Which again must have been a bit scarey for kids, but Brandon was used to this. After his father's death at the early age of 32, in 1973, Brandon, his mother, and sister moved to Los Angeles. His mother, Linda, wanted to take her two children out of the spotlight, which gave them a chance to have a normal childhood. Brandon didn't really get into training until he turned 18. He often got into fights and had kids start trouble with him simply because he was Bruce Lee's son, so he must be tough. Since the beginning, Brandon was drawn towards performing. He always wanted to be an actor and pursued that from a very young age. It's all he wanted to do. He wanted to be known for his acting ability instead of who his father was. He only hoped to be able to invest as much passion into acting as his father did in martial art. Which later was very difficult being who father was. It was very difficult for him to get any roll outside the martial arts. His mother said that even in his earliest roles, he was great. She said she would often forget that he was her son when he was on stage. Because he could just really take the character. After taking high school drama classes, Brandon Left to attend acting classes with Lee Strasberg, later going on to study acting at Emerson College in Boston, Massachusetts. He later joined Eric Morris' American New Theater company in New York City and followed the company's relocation to Los Angeles and appeared in their production of Full Fed Beast for playwright John Lee Hancock. Brandon later returned to training at the Inosanto Academy of Martial Arts in Marina Del Rey, California, which was run by two of Bruce Lee's former students and instructors, Danny Inosanto and Ted Wong. His first professional acting job came at the age of 20 when he appeared in the CBS television film Kung Fu: The Movie in 1986. He played the long lost and revengeful son of David Carradine's character Caine. Ironically, a movie thats basic theme was partly created by his father Bruce Lee, who was reject the part of caine because of his race. Brandon also made several appearances on Hong Kong television with his father. He later landed a role of the evil son of Yakuza godfather on an episode of O'Hara with Pat Morita. It bothered Brandon that Asian actors were not consistently getting starring roles in American Films and television. Brandon had to travel to Hong Kong in order to make his feature film debut, starring in Legacy of Rage (1988). Brandon then landed a role in the 1990 movie Laser Mission which was filmed in Namibia with featured star Ernest Borgnine. Brandon finally made his American feature film debut in Showdown in Little Tokyo for Warner Brothers in which he played a cop Johnny Marata with fellow actor Dolf lundgren, who teamed up to take down a japanese mafia druglord. Brandon then landed a major starring role, that of Jake Lo in Rapid Fire for 20th Century Fox, written with Brandon Lee in mind. Brandon also helped work on Rapid Fire's fight choreography to bring some Hong Kong Movie Flair to the film. 20th Century Fox signed Brandon to do two more films for the studio. On February 1st,1992 production of The Crow starts. Brandon plays Eric Draven, a soon to be married rocker who comes home to find his fiancee raped and beaten only to be murdered along with her. A crow brings his spririt back to revenge their deaths. For the role of Eric Draven, Edward R Pressman wanted Christian Slater. But Slater's asking price was millions too high. So Brandon signed on for $300,000 an a three movie contract. Brandon was so happy to be in this movie, it was more of his movie. He put everything he had into his character. He even lost weight to fit the skinny rocker look need for his character. Not many actors lose weight for films. On March 31st, he was shot while filming. Like a lot of movies, the scene's in The Crow, were not filmed in chronilogical order of the script. Instead quite the opposite. They were filming the flashback scene, where everything was kind of redish. There were 8 days of filming left. Mostly the flashback loft scene's. Brandon's character was to come home carrying bag of groceries to find his fiancee being beaten and raped. Fun boy was to then turn and shoot him. There was a movie rigged explosive type deal in the bag of groceries to give the effect that his character had been shot. Instead Brandon had actually been shot. He was supposed to be fall backwards and instead he fell forward onto his knee's and then onto the floor. Everyone just assume he was over acting the part. What had actually happened was, a tip from a "dummy round" ( a prop bullet that has no gun powder) had lodged the prop gun. Which for the scene used a shell but only containing gun powder to give off the loud bang and fire etc. Which in turn shot the tip of a .44 out. It was a careles accident. An accident that could have been avoided had everyone done their part and properly cleaned and checked the guns between scenes like they are supposed to. So this was very tragic. 200 people stood while brandon fell to the ground. Director said cut and brandon never got up. that's when they realized he was hurt. Brandon was rushed to a hospital. The bullet had struck him in his abdomen and settled near his spine. The bullet tore several major organs before settling in his spine. Causing a hemorrhage. The doctors work for five hours, but could not stop the bleeding. He was shot about 12:30 am. Brandon died 12 and a half hours later, at 1:04pm. at the Wilmington Hospital. Brandon was supposed to marry Eliza Hutton on April 17th, about two weeks after his death. He was buried along side his father at Lake View Cemetary on April 3rd. Over 400 people attended his funeral. Including Steven Seagal, David Carradine, and Brandon's best friend and stunt co-ordinator, Jeff Imada. Jeff was so saddened, he could barely speak at the funeral. Linda, his mother kept everyone's spirit up by saying "Brandon would have wanted this to be a joyful occasion, we're here to be happy and celebrate the life of Brandon".